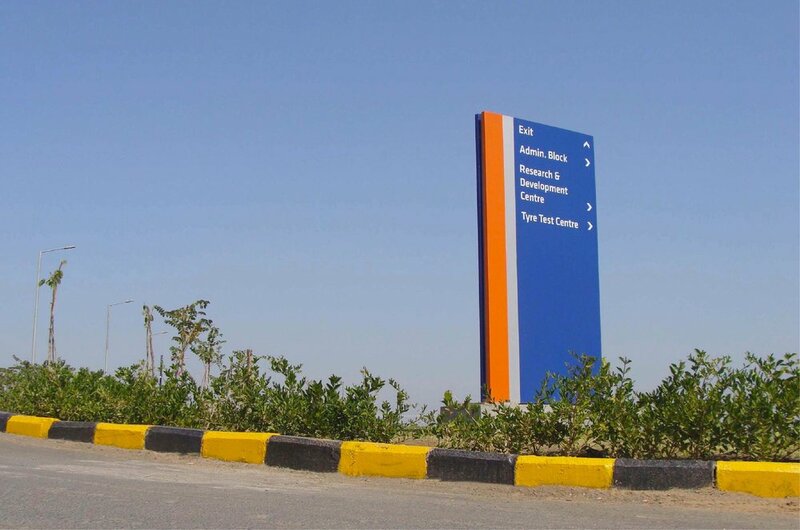 After the successful roll-out of CEAT retail outlets, we were offered the task of designing the signage & way-finding system for their state-of-the-art manufacturing facility at Halol, Gujarat. The way-finding approach highlighted the process flow across the complex while aiding the zero-error manufacturing effort. The signages exemplify modernity while communicating efficiency and vibrancy. We used CEAT’s brand colours and a minimalist linear language to induce instant connect, structural modularity & uniformity in the visual treatment. The signages appear robust and capture the brand essence. Each signage type was carefully detailed to conceal hardware fittings, underwent rounds of prototyping and was tailored to suit contextual requirements. The structural design for all external signs factored in the severe, unpredictable weather conditions characteristic of the region. Way-finding signs are set up along the main thoroughfare all around the facility. Full size mock-ups of each signage type were prepared and tested at all pre-planned locations for effective visibility, legibility & readability before finalizing the master signage layout. Building Identification signs identify the key office buildings while Directional signs guide pedestrian & vehicular traffic to specific destinations, entries & exits. Impactful road markers are strategically placed along the highway to guide visitors to the complex. Large 18 feet high CEAT logo signs were structurally engineered for installation at vantage positions on the main manufacturing building facade. It posed a challenge owing to the mammoth size, weight and critical placement. Prior to welding these signs to supporting metal frames, contiguous deposits of highly flammable carbon powder had to be laboriously eliminated from the site. Post installation, these landmark signs are visible from miles around. 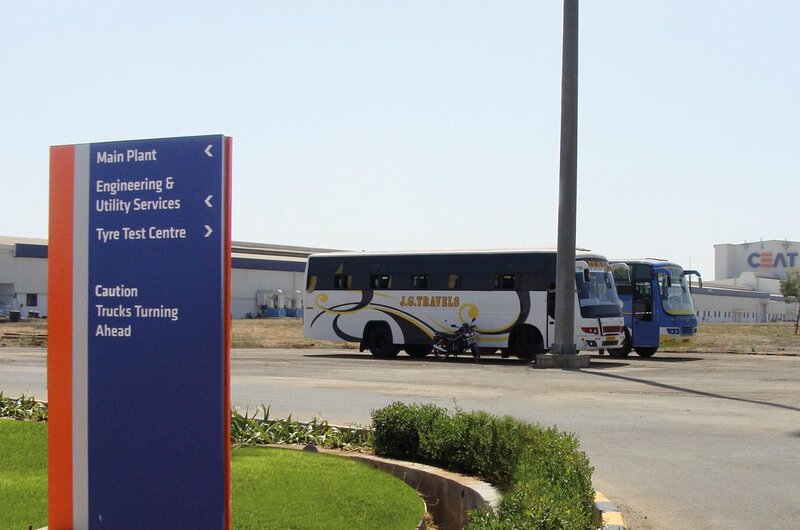 The way-finding system has been successfully implemented at the complex and has stood the test of time.